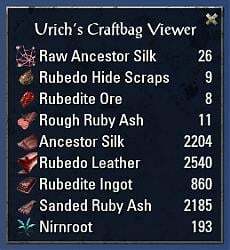 This is a simple add-on which places a window on your screen that can be used to display how many of an item you have in your craft bag. You can now pick which items you want to see in the window. The last selected item will be added to the bottom of the list. /ucv - Show or hide the UCV window. /ucv lock - Lock the UCV window on the screen. /ucv unlock - Unlock the UCV window on the screen. Added Gryphon Plumes, Bloodscent Dew, and Argent Pelts to the item list. Added style items for the four new Clockwork City motifs. Added style items for the three new HotR motifs. Added the dwarven centurion ingredients. Added the master writ voucher merchant items. Added style items for the four new Morrowind motifs. Resolved a folder structure issue. Added checks for craftbag access. Added window toggle to keybinds. Added a full settings menu with selectable display items. Implemented per character saved variables. Wait, are you saying you have some item showing in the display that won't fit because you have over 9999 of them? Do you have a page where I can submit a bug report for not selling things? Jokes aside, yeah, I'll take a look at making that size itself dynamically. One more thing, really love the skill point finder !!!! Hi there, love this add on !! 1. Have you tried reloading the UI? 2. Are you using any type of auto loot function? If so, the in-game looter or an addon? 3. Have you moved the window? 4. If you've moved the window, did you lock it afterward? 5. 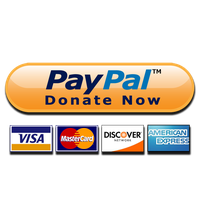 Do you have an active subscription (craftbag access)? 6. 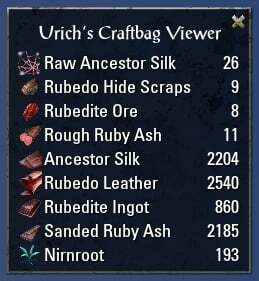 Are the items you harvest transferring to your craftbag? 7. Do the values update if you enter and exit the character screen? 8. Do you have any crosshair mods installed? 8. What kind of addon do you mean? Last edited by BioNik : 08/28/17 at 08:47 PM. Hello! I really like this addon and would love to see a variation of it that tracks the common fish (like longfin) in your regular bag. If you could make an addon like that or modify this one I'm sure the fishing community would love you for it. Shortly after posting this I found http://www.esoui.com/downloads/info1...mstracker.html which can serve my fish counting purpose. However, if you could make something similar that totals the number of fish that would be perfect! Last edited by MrPlops : 04/18/17 at 07:11 AM. Last edited by MrPlops : 04/18/17 at 06:23 AM. Mine isn't updating on harvest. Are others seeing the same? I do have a ton of add-ons so it could be a conflict. Hey dominoid. Can you tell me a few things about your setup? Last edited by fritzOSU03 : 03/21/17 at 01:29 PM. And a must have... for anyone who is both a Master Craftsman and a True Explorer! For at a glance form and function, I'm quite pleased to see Urich's mod is not only a must have, but he seems to be interested in expanding on his work. In any event - I applaud you, sir! Take care! If keeping up bugs and coding plus listening to reasonable user suggestions, I see this addon going places. As for the farming section, you should talk to Dolgubon and see if you can use his "Lazy Farmer" addon for reference when creating yours. Looks good, only request I have is make it have a farming mode, where it starts at 0 in each slot then goes up as you run around and collect nodes. Thanks for the feedback. I'll keep that in mind. I'd like to make it a bit more dynamic and customizable. Last edited by Diesosoon : 03/20/17 at 02:51 PM. Last edited by Diesosoon : 03/20/17 at 02:29 PM.